Whizible Helpdesk, a cloud-based, fully automated module, is an ideal solution for customer service ticket resolution, supporting global software service delivery issues. Our team of designers recently redesigned the UI (User Interface) of Whizible Helpdesk module to enhance the UX or User Experience. The helpdesk module can also be sold as a stand-alone module “WhizHelp” to complement other project management software products. The customers who are the users of the product or service can create a ticket to communicate with the company and raise the issue that they are facing. The Helpdesk converts emails and web posts into tickets and it gets registered in the Whizible Helpdesk database of tickets. When the customers logs in to the ticket using the self-service portal, they are encouraged to pinpoint the nature of the problem and the urgency of the solution, for example, in case of a ticket requesting IT support, the customer is required to specify whether it is for a routine change or to report an incident which is extremely critical leading to stopping of work at the customer’s end or a hardware problem, etc. The help ticket gets classified automatically using the rules set in the system. There are pre-defined rules based on the process analytics at the backend. These can be modified to incorporate user organization’s classification terminology. If the customers send issue tickets by any other method, then the CRM executives can record them in an Excel file. Whizible helpdesk supports bulk upload of MS Excel-based requests into the ticket database. The helpdesk manager has the permission to upload bulk requests. When the helpdesk manager gets all the request tickets logged in by customers, they are already organized using defined categories, complexity levels and urgency, so that it becomes easy to assign them to the right person to resolve. There are multiple pivots available for the helpdesk manager to manage the issue tickets and track the SLAs. This helps the customer support team to address and resolve all the tickets effectively and without delay, ensuring customer satisfaction. The new and user-friendly UI of this module further makes the customer service experience very delightful. Why is the customer/ project issue management critical to the success of a project based organization? What makes your customers unhappy? Put yourself in your customers’ shoes and you will know the answer to this question! In case of a company engaged in selling B2B products or services, the sale is the starting point of the customer relationship. There could be many areas which could become irritants and create roadblocks to ensuring the customer happiness. The Whizible Helpdesk is a part of the project management tool helps to address customer unhappiness and convert it into customer satisfaction. The helpdesk module ensures that all the internal and external customers of any project-centric service firms are well looked after. The engineering design solutions or the software products designed by experts are deployed in the customers’ offices and the designers and developers are responsible for ensuring that these solutions work perfectly for their users all the time without any hassle. This creates the need for setting up helpdesks which are available 24/7 to support the customers. Manual handling of the service requests, often called service tickets, becomes very difficult for the customer support teams, thereby resulting into the inefficient handling of tickets and delays, rejections and re-work, leading to customer dissatisfaction. 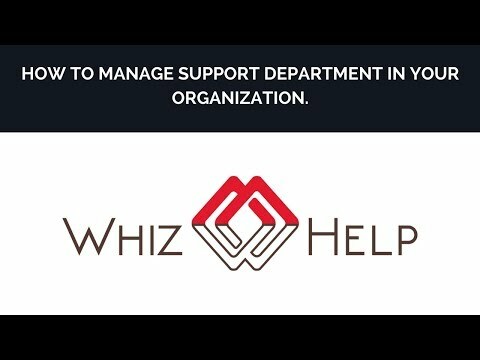 Whizible Helpdesk module facilitates the customer service and product support departments, by addressing the issues or bugs in the project delivery. This module can also be installed as a stand-alone module also, outside Whizible project management suite of software products. Whizhelp, if bought without other Whizible project and resource modules, can be easily integrated with the existing CRM (customer relationship management) or PLM (product lifecycle management) tools that your organization is already using. Although, it is recommended that using the entire suite of Whizible project and resource management software to realise the maximum value to the customers.